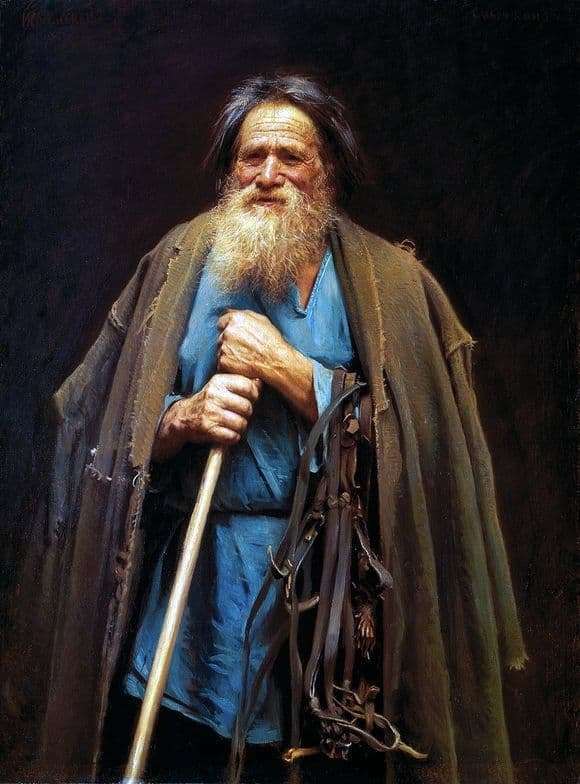 For many art lovers, Kramskoy is associated with peasants. He is one of the few artists who skillfully imprinted on the canvas the individual characters of their heroes. The Peasant with a Bridle of 1883 is one such example. The painting depicts Mina Moiseyev, who laughs and stands, leaning his hands on a shovel. At first glance it seems that the decrepit grandfather is standing in front of the viewer. During his years he experienced poverty, difficult life, hunger, but all this did not break him. One has only to take a closer look at the character, as strong shoulders visibly look out from under a faded shirt. The folds of the armchair look majestically and highlight the shoulders of his grandfather. The face of Mina Moiseev is evidence of his wisdom and an indication that the old man has gone through a lot. Because of his beard and eyebrows, many experts confused this canvas with the image of Tolstoy. Mina’s mouth is captured in a half-open state, as if the hero is laughing after the story just told. Wrinkles cover his face, but the old man’s strong hands signal that he still has enough strength to work. The picture is made in bright colors, which is not typical for the artist’s work. But it can be understood: light shades perfectly convey the image of Mina Moiseyev. Of particular interest are the blue robes and hair of an old man, whose color is similar to aged silver. “The peasant with a bridle” imbued with love and affection for the Russian peasants. Kramskoy sympathizes with and worries about people who during their lifetime had to suffer a lot. But these people have passed the tests that sent them life, remaining strong and proud.